Whether it’s for insurance, to influence home buying decisions or simply for our own peace of mind, knowing how safe your local area is an important part of making sure you’re protected should the worst happen. We here at Wilson Alarm Systems have delved deep into government and local police data to give you an overview of how safe the Leicester area is – as well as some essential resources and useful protection tips. This chart covers a breakdown of monthly incident rates in given Leicester postcodes; these five postcodes are the ones ranked in the top 200 by UK Crime Stats. 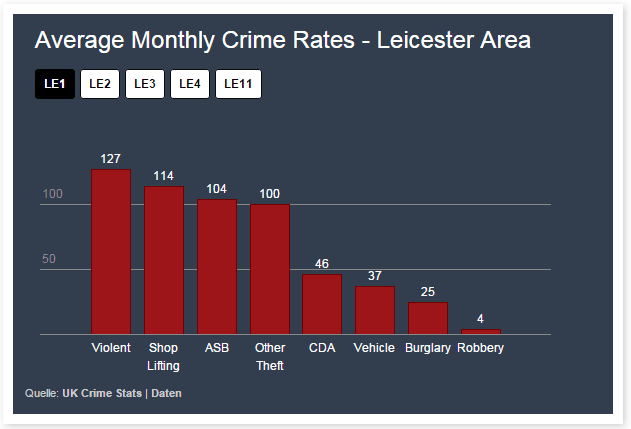 The breakdown shows interesting variations between types of risk in given areas; for example, shop lifting incident rates in LE1 are far higher than LE2, and violent crime is lower in LE11 than any other area in Leicestershire. In terms of burglary and criminal damage, LE1 is statistically the ‘safest’ area. Statistically, though, crime in Leicestershire is falling – which means risks of most of these crimes are lower than it used to be. Click through to your postcode in the graph and see where your area rates for risks of particular crimes; you can use these to your advantage by ensuring you can remain protected. Which Areas Are Most At Risk? Source: https://www.police.uk/leicestershireThe government’s Police.uk site has a fantastic UK-wide tool for tracking local crime rates by individual postcodes and towns, allowing you to even drill down as far as very specific local area searches and street names. The example animation above shows the statistics for the Leicester Forest East, Kirby Muxloe and Glenfield areas; you can also click through here to choose additional areas covered by Leicestershire police or draw out your own area to track. Crime rates are falling in the area are falling; statistically, it is becoming a safer place to live. In Leicestershire, overall crime rates fell by 3% last year compared with the year previously, with burglaries down by 9%. As an example of current crime prevention in the area, Leicestershire Police in January tackled a two-month long burglary spree, and the number of burglaries in that local area fell by a half. Sign up for your area’s Neighbourhood Watch Scheme – add your LE postcode to find your nearest scheme. Register any property through the Police’s Immobilise initiative – Leicestershire Police are currently signed up to this, so it can protect any belongings (particularly valuable ones). Keep valuables out of sight; keys, mobile phones, cash, portable electronic devices (e.g. laptops). Store ladders and tools away at all times; they could be used to break into your home. The Police’s burglary prevention advice also recommends getting a visual burglar alarm fitted – you can view our full range here. Improving the access security and locks on doors and windows is also recommended; most burglaries occur when a door is either forced open at the lock or kicked in.